If you took part, first of all, well done you! As a reward for you and those brilliant feet and legs that got you round, I'm offering £5 off your next reflexology treatment with me. Why not treat yourself? You deserve it! All you need to do is quote 'Falmouth Half' when you book. 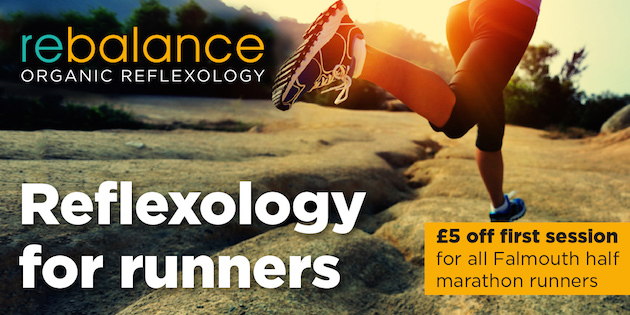 Reflexology can have plenty of benefits post-race, including improving your blood flow which boosts your body’s natural ability to heal an injured area and aids muscle repair. Reflexology can help remove lactic acid from your legs four times faster than massage. A treatment may also help you if you’re coping with pain from running injuries or niggles. Finally, and in very simple terms, reflexology feels soooo good! It's a fab, relaxing and soothing treat for tired, sore legs and feet!